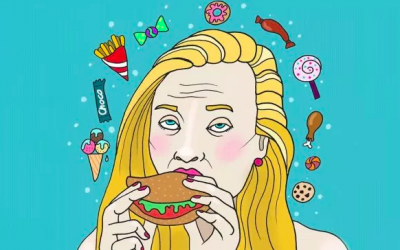 Obsessing about food is all too common. It’s often seen as part and parcel of being a human being. However, that doesn’t have to be the case. In this article I am going to cover; what food obsession is, how it comes about, and how to stop food obsession. Declining those social occasions in the future, because of the stress of not knowing what you can eat. You might identify with one, some or all of these. This can feel debilitating and wreak havoc on trying to have a social life! So where does food obsession come from? Food obsession can occur if we have rigid rules around our eating, whether these are self-inflicted rules that we’ve picked up over the years, or from an external source (e.g. a diet) (1). Restriction can be physical or emotional. Physical restriction: when the food is “forbidden/not allowed” and you physically are told to not eat it (by yourself or others). E.g. no lunch before 12 ‘clock, no carbs after x time, a points, calorie or meal limit. 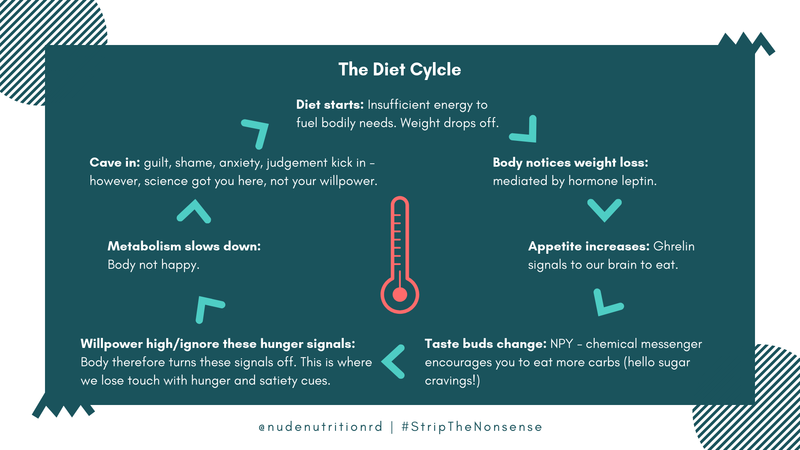 Psychological restriction: when certain foods are labelled as “naughty” or “bad” and we carry guilt and anxiety for wanting to eat them, or actually eating them. 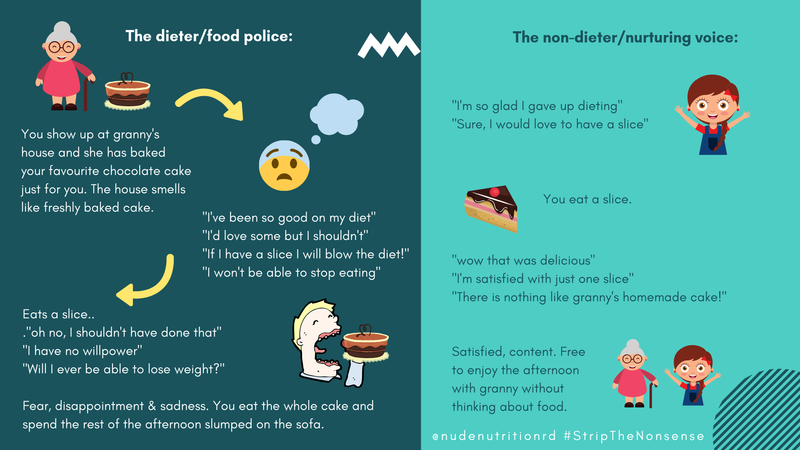 If you’re in the latter, chances are that diet culture has taught you to label foods as “good” and “bad”. This is where we feel “good” for eating a salad, and “bad” for eating a cookie. Placing a moralistic value on foods can interfere with our relationship to food in a negative way. What happens when we restrict as a result of these food rules? The food rules which make us restrict mean we become totally obsessed with that food. This food obsession can cause a bucket load of different emotions too. Food obsession affects our mood and our relationships. It can affect our energy levels and desire to exercise. It can cause tainted memories of special occasions because you weren’t able to truly enjoy yourself because the food that was present controlled you. It is time consuming. It can make you feel alone, lost and helpless. It can make you feel as though there is No. End. In. Sight. So how can we stop food obsession? Eat the “bad/forbidden” foods, and stop placing a moral value on them. No single food is “good”, “bad” or going to make you “healthy” or “unhealthy”. It’s time to unlearn the food rules that have dictated which foods are “good” and “bad”, so that you can finally enjoy all foods in the that makes you feel good. This sounds scary, I know. The biggest fear is that we will just eat ‘junk food’ all the time if we eat our ‘forbidden food’. Whilst it may feel that is the case in the short term, this dissipates as time moves on. This process is called habituation (3) – it’s a scientifically proven thing! I am going to use a non-food example to explain habituation. Imagine buying a new top that you love. When you first wear it, it feels exciting! Maybe you even wear it more than normal at first, however, after time it heads into the draw with all of your other clothes. It still feels nice to wear at times, but you’re not obsessed with it like you were at first. The same happens with food. When we allow it in, we get used to it and whilst it may still taste good, it becomes less exciting. 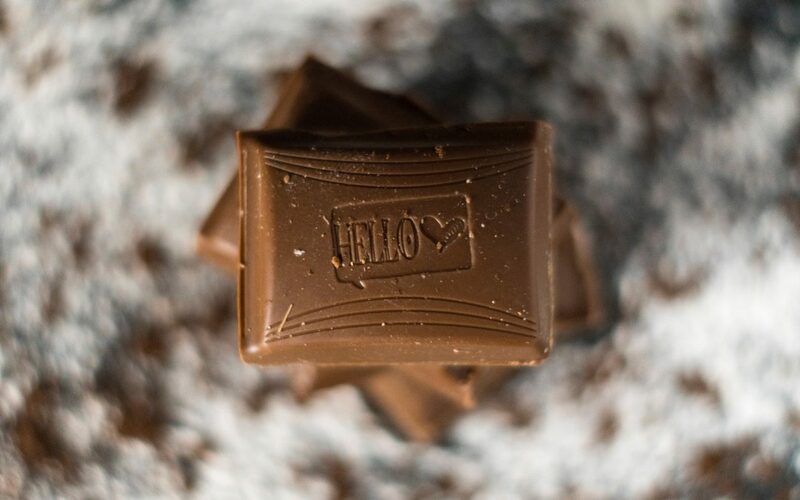 Say chocolate is your “forbidden” or “bad” food that you feel obsessed with. 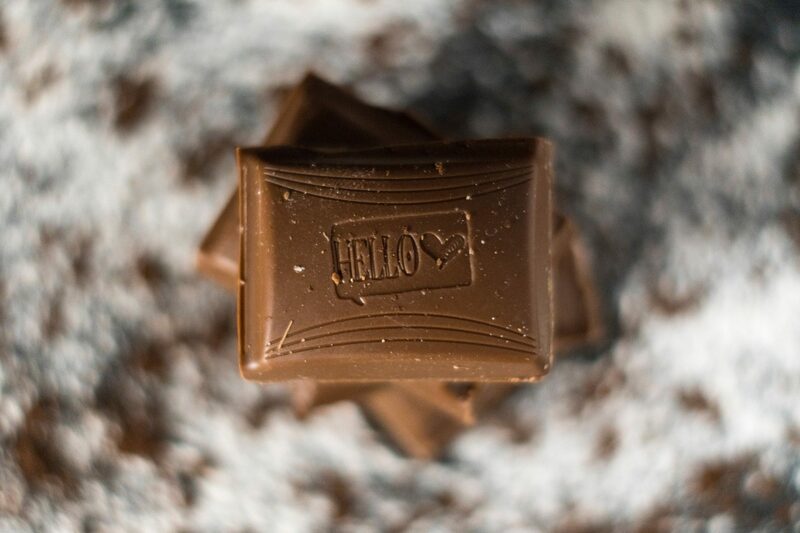 You need to be specific about the brand, type and flavour of chocolate. Because if you’re introducing chocolate buttons, chocolate biscuits, chocolate toffees, chocolate icing all at once it will take you 4 x as long to become habitualised to it. Be specific about the brand a flavour! Next, plan out when you would like to practice eating it whilst giving that chocolate your undivided attention. Perhaps at a time when you’re not too vulnerable (I.e. stressed, tired or hungry). 30-60 minutes after a meal is a good time. Practice eating that food paying attention with all the senses. As an intuitive eating coach, this is where I guide my clients through a mindful eating exercise. It’s amazing to hear what flavours, textures, smells and emotions people notice when they pay attention. 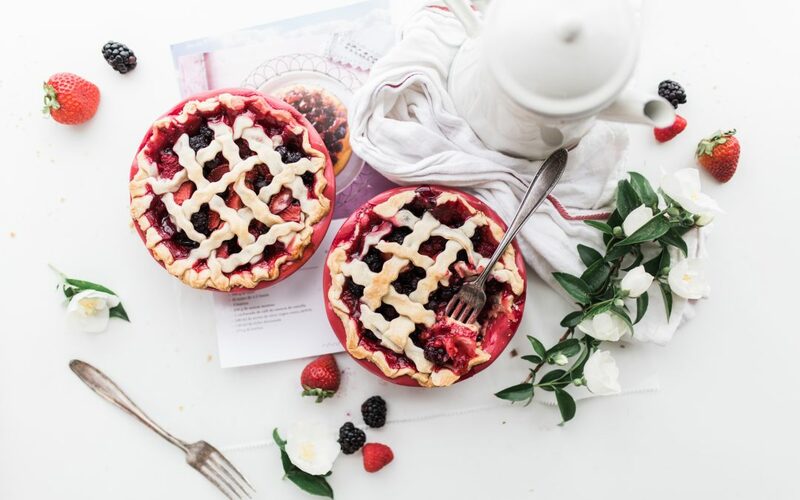 Eating mindfully and without judgement allows my clients to identify firstly, whether they actually like the food, and secondly, how much of that food is necessary for them to find the point of satisfaction. Stopping food obsession can take time, but it’s possible when we stop restricting ourselves. It takes time to feel comfortable allowing “forbidden” foods back into our life – particularly if we’ve been a victim of diet culture for many years. It’s not something that has to be perfect or done all at once. It is a process to help you realise that you can trust your body and realise that food doesn’t have to control you. Once you stop restricting, the food obsession will diminish and you can start to enjoy all the fun things in life again. It was a simple enough question, but it caught me off guard because usually I have a little more time to answer this in detail during my 1:1 consultations with clients. As there are 10 principles that guide Intuitive Eating, I wasn’t about to go through each one detailing the research and theory behind it (our coffees would have been cold by that point! )… so instead I discussed with her five practical steps she could take on how to start intuitive eating. And now I’m sharing these with you too in a little more detail. As we already know, we live in a world where thinness is preferred and as such, our social media feeds are usually dominated by thin, white, privileged people perpetuating the thin ideal. Research tells us that we need to avoid or challenge this type of imagery because of the association between being exposed to unrealistic, thin-idealised images and body dissatisfaction (Tiggemann, 2015). Now that those people are no longer popping up on your screen, it’s time to start following body positivity superstars who are changing the conversation. This can be really hard to do when we live in a diet culture where food is given a moralistic value. That is, foods that are seen to be associated with thinness and guiltlessness = good. And any food that doesn’t fall in this category = bad. And that’s where we start restricting and forbidding the “bad” foods … which ultimately leads to deprivation. This leads to biological cravings for said forbidden food. Which leads to a bingeing episode, guilt and starting another diet to be “good”. To create a healthy relationship with food, we have to stop describing food in moralistic terms. Because you know what? There is not one food that will make us thin or fat, healthy or unhealthy. We know what the evidence says about this. It says that dieting and restricting food for the purposes of controlling weight does not work long term. There is not one scientific study that shows this. Why? Because of the set point weight. This is the weight that our body works very hard to maintain (usually within a range of 4-5kgs) to carry out all the necessary functions to keep us alive. When we’re not swinging between doughnut land (i.e. being bad), and diet land (i.e. being good), our weight settles at it natural set point. This weight range is already pre-determined, largely by genetics. In fact, it’s estimated that our weight is about 70% determined by our genetics. 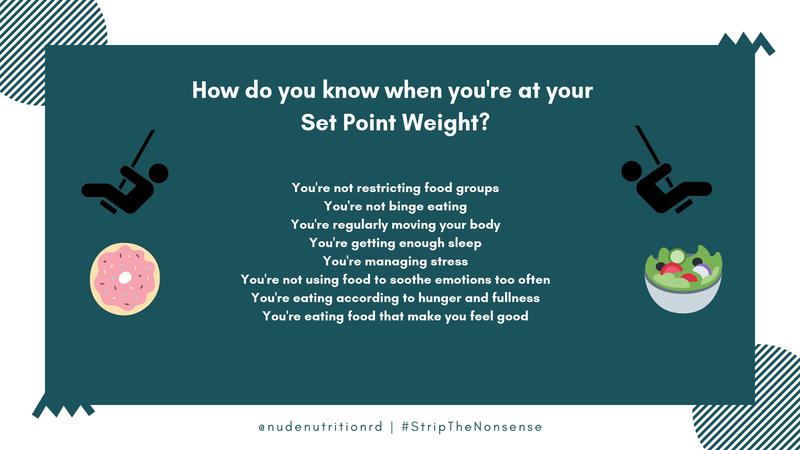 If we start messing with our set point weight through dieting, it starts to put a strain on our body and impact on how well it can do its job. Lynda, a lifestyle coach, explains this analogy really nicely in a short 3-minute video here. We have internal body cues that tell us when we’re hungry and full to ensure that we eat according to our needs. Biological chemicals (Neuropeptide Y & Ghrelin hormones) are released more rapidly to drive us to eat when our bodies are in famine. So, as you can see, when we try to lose weight in a restrictive manner (and drop below the set point weight range), our body works damn hard to put that weight back on asap. In essence, diets make us work against ourselves and paradoxically, we end up achieving the exact opposite of what we wanted in the first place. Argh! It’s time to ditch the rigid exercise plans and start moving your body because of how great it feels! Now it doesn’t matter if you’re not immediately jumping out of bed wanting to strap your joggers on again. It was often associated with dieting. And when the diet failed, so too did the exercise. You were always pushed by others to exercise and therefore have always rebelled those people. a. Focus on how exercising makes you feel, rather than thinking about the calories that are being burned. Think about how you feel after exercise – Energy levels? Confidence? Stress levels? Sleep? Note how you feel when you exercise and when you do not exercise. The positives you feel after exercise is often enough to get you back out there, because why would you not want to do something that makes you feel so wonderful! It is well established that physical activity provides positive health benefits over the long term. 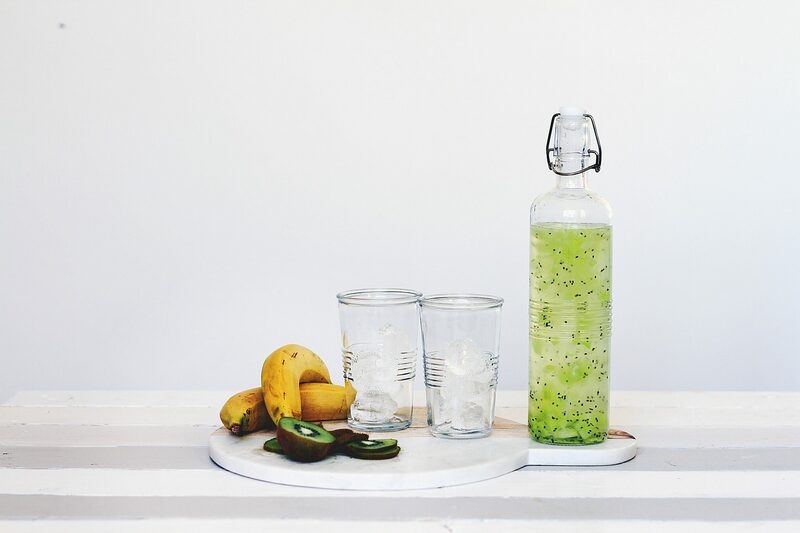 It has positive impacts on metabolism and preserving lean muscle mass, yet doesn’t really have much of an impact on weight loss. So, if you’re attempting to lose weight solely by exercise, it can be easy to lose motivation when you don’t see “progress”. It’s time to start viewing exercise as beneficial for improving quality of life and stave off disease, rather than as a weight loss tool. It increases bone strength, improves heart and lung function, decreases blood pressure, increases metabolism, improves cholesterol levels, improves satiety cues, improves mood, reduces chronic disease risk and delays cognitive decline associated with ageing (Chaput et al, 2011). Find something that you enjoy and start out slowly. There is no need to follow a rigid exercise plan that forces you meet certain physical activity targets. You just move when you have the time and when you feel like it! Whether it’s going for a walk around the block while listening to your favourite music or podcast, walking to a bus stop that’s one stop further away from your destination or dancing around the house. Whatever it is, it all counts towards exercise. And when you start your joyful movement, also remember to have rest days if your body feels tired. The last thing you want to is to experience burnout, which is another side effect from dieting world. 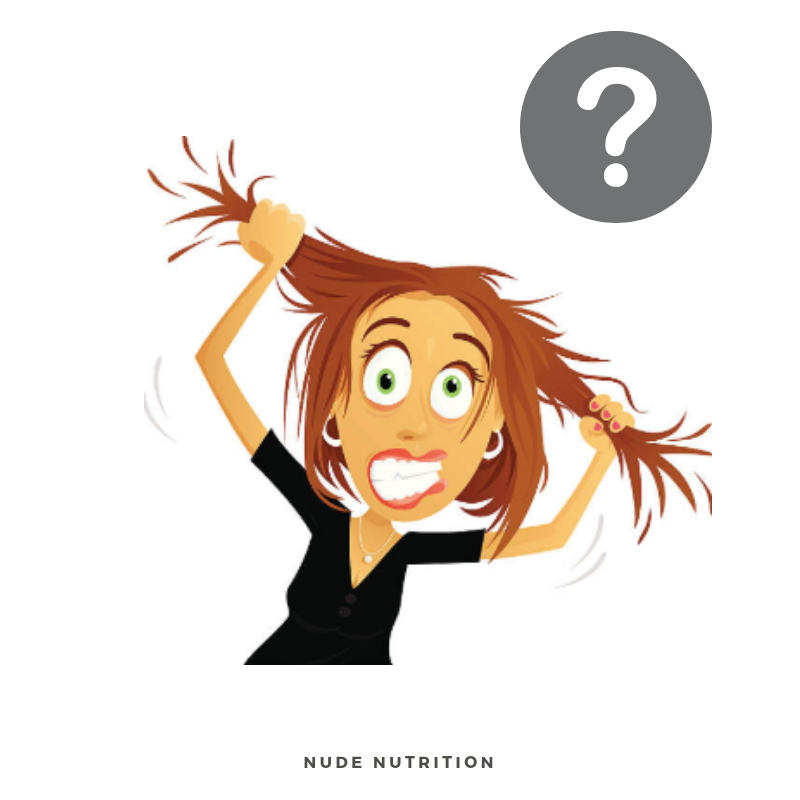 One of the most important steps to break free from dieting and food worry, is to recognise when you’re hungry. To really start listening to your inner body signals, get into the habit of asking yourself, “am I hungry?” each time you go to eat. You could even keep a little diary like the one below. If you’re allowing yourself to get to a point where you’re simply too hungry, of course you are going to have the urge to want to binge, or eat past the point that feels comfortable. At this point, we think we can’t stop binge eating, or that we need emotional eating help, when in fact, it’s just biological hunger. 2) You would eat anything put in front of you. 4) A little hungry. You can wait, but need to eat soon. 5) Neutral. Not hungry, or full. 6) No longer hungry. You sense food in your stomach, but could definitely eat more. 7) Comfortable, could quite easily stop here. 8) Not too uncomfortable, but definitely very full. 10) Very uncomfortable – Christmas dinner stuffed. 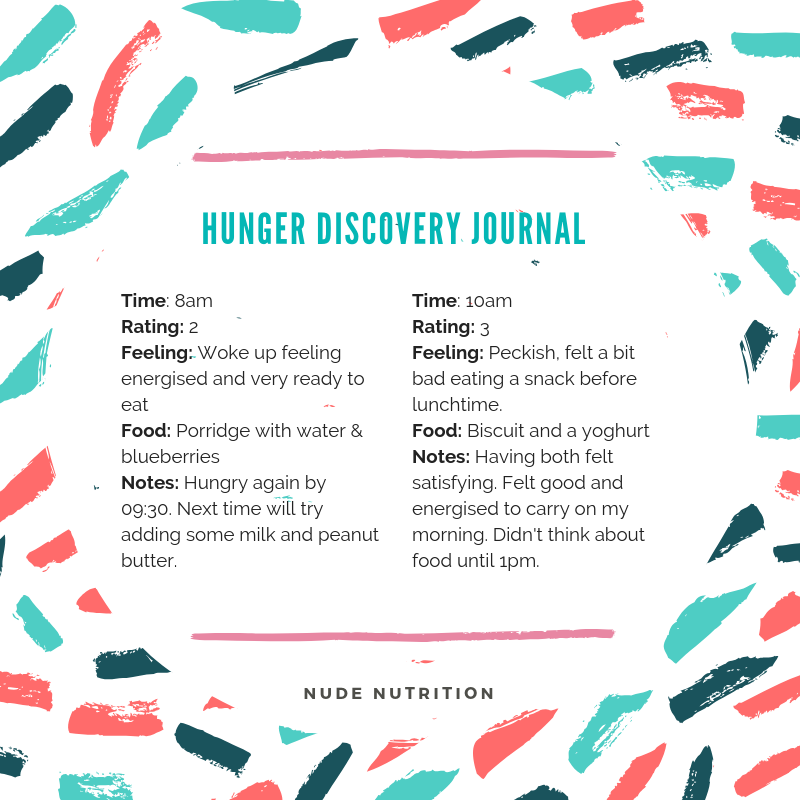 It usually feels good to start eating at a 3 or a 4, but explore for yourself, keeping a little diary like the one below. Well that’s my top 5 strategies on how to start Intuitive Eating. It’s not about getting any of these things perfect, but instead chipping away so that barriers start to come down. Be kind to yourself and allow plenty of time to see how you can apply these steps each day. This is about making progress towards healing your relationship with food, not striving for a perfect diet (which by the way, doesn’t exist). If you would like more information on how to stop binge eating, how to stop food obsession, how to stop emotional eating, and how to start intuitive eating, check out my free audio recording. It provides you with 7 actionable steps on how to start intuitive eating, with an actionable workbook. Does eating organic food lower your risk of cancer? – You always buy organic food where possible. – You buy organic food when you can afford it because you’ve heard it’s healthier. 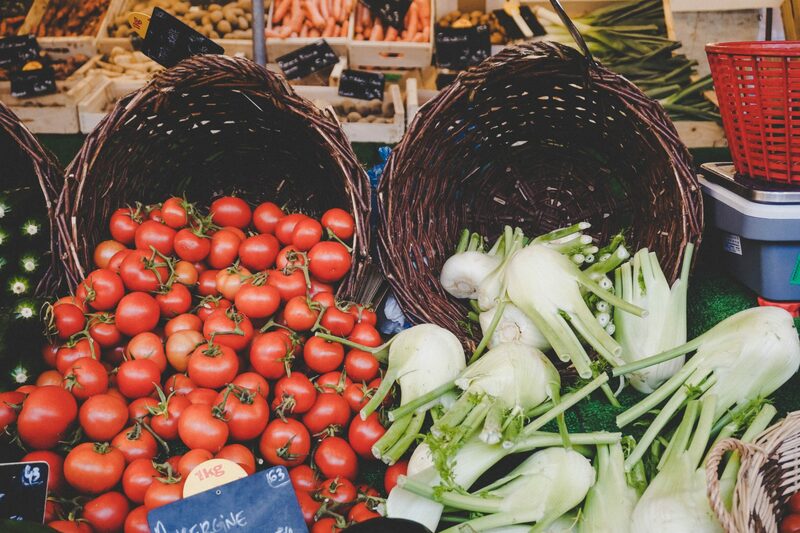 – You’re not really sure whether you should be buying organic, especially when they can cost 10% to 100% more than food grown under conventional conditions. Last week in the headlines, the Mail Online, The Sun, and The Times (to name a few) stated that eating organic food could reduce our risk of cancer. This headline came off the back of a recently published French study. The media took the findings at face value without acknowledging other factors that could have potentially influenced the results. In this article I am going to offer the truth about organic food and cancer, so you can make an informed decision. 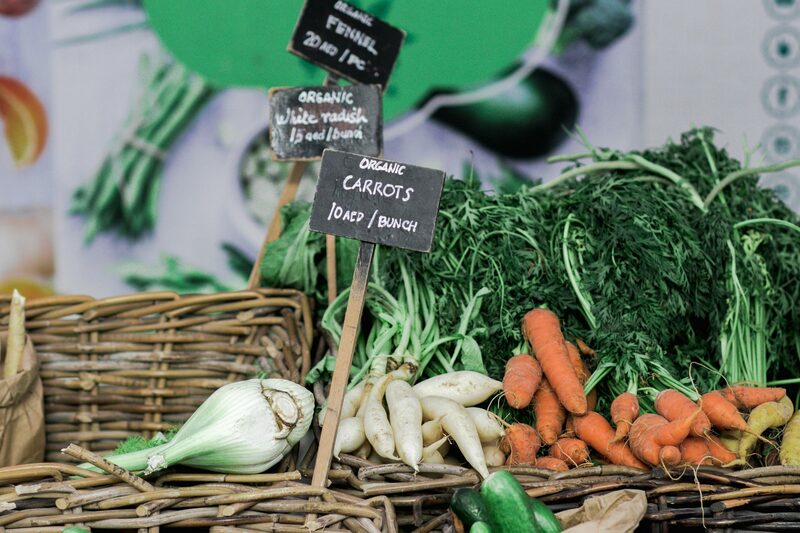 Organic food is any food that is produced by an overall system of farm management and food production that complies with a set of standards set out by European Law. The EU standards are currently under review. The standards vary across the world, but in general they combine practices that promote ecological balance, conserve biodiversity and strive to cycle resources. The use of pesticides, fertilisers, irradiation and food additives is usually restricted. The large French study questioned 69,000 French adult volunteers on their consumption of organic food and followed them over 4.5 years to see how many developed cancer. Other studies have identified the potential benefits of eating an organic diet, such as lowered level of pesticides in urine samples. However, few studies have looked at the potential link with cancer. That’s what made this study so exciting to the media. Data were collected online, via a website based platform. The study participants were asked to provide information on how often they ate 16 labelled organic products. They were also asked to complete three 24-hour food recalls (writing out what they had eaten in the last 24-hours). In total, 1,340 (2%) of the study participants developed cancer. The cancers developed, included breast cancer (34%), prostate cancer (13%), skin cancer (10%) and bowel cancer (7%). More specifically, significant (notable) links were found between postmenopausal breast cancer, lymphomas overall, and non-Hodgkin’s lymphoma specifically. The researchers found that people who ate the most organic food, had a 25% reduced risk of cancer, compared to those who ate less. Despite the encouraging media reports, this study does not prove that eating organic food will protect you against cancer. Although this study used a large sample size there were a number of limitations deeming the results not as positive as the media make out. 1) There are a number of potential factors that could explain this link that could be interfering with the results. 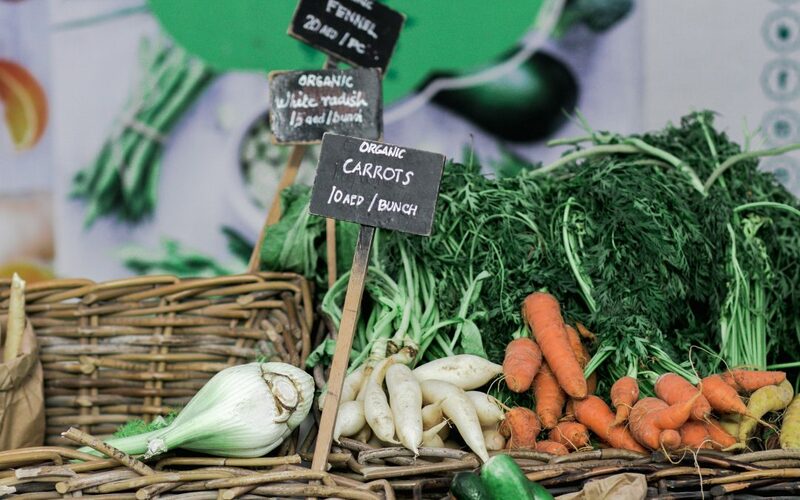 Other important factors such as high income or physical activity level are especially important when studying the health benefits of organic food, because eating organic is associated with lots of things that also help you live a longer, healthier life. In other words, people who regularly eat organic food tend to have other lifestyle factors and habits that could easily lower cancer risk as well. Even within just this one study, high organic food consumption was associated with higher income, having a better job, being more active, eating more fruits and veggies, and eating less meat and processed food. Those are all things that make you more likely to stay healthy than those who can’t afford to take such good care of themselves. 2) The study results were based on volunteers who are already pretty health conscious individuals. This makes it difficult to transfer the findings to other groups of people aside from middle-aged well educated French women who already exhibit healthy behaviours. 3) There are limitations to self- reported food intake. The intake of foods was not actually measured, rather it was reported on an online survey. Also, organic food intake was recorded at a single point in time and self-reported. This may be inaccurate and not reflect lifetime habits. 4) Observational studies (which observe groups of people over time) such as this, are useful for exploring potential links. However, they can’t prove a true cause and effect, as other health and lifestyle factors could be having an influence. 5) Cancers still developed among people who ate the most organic food – it’s just there were fewer cases (269 vs 360 among those eating the least amount of organic food). So even if there is a direct link, eating organic food is not guaranteed protection against cancer. This study is a valuable investigation into potential links between eating organic food and cancer risk. However, the author’s conclusion may be a little premature. Other large and high-quality research has identified no association with overall cancer incidence. This study alone cannot prove that eating organic food will prevent you from getting cancer. So, if you prefer organic food that’s fine, but there is no strong evidence that it makes a positive difference to our health. There is however, strong evidence that they make a dint in your monthly bank statement! References – in links throughout the text. 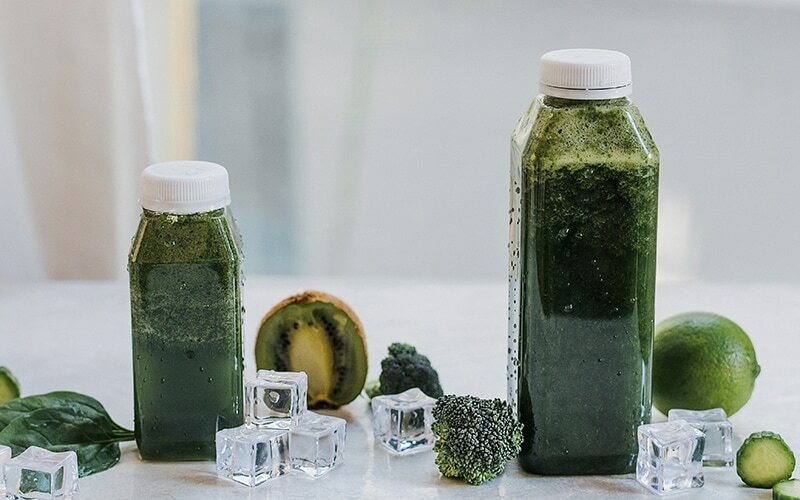 When trying to lose weight, it may feel like an easier option to go for the quick fix of a detox diet or juice cleanse for a few days. Whilst they aren’t particularly enjoyable, there may be some pros. 1) You get to take time off work and do nothing, because the headaches, fatigue, irritability, and potentially messed up stools mean you will not be wanting to leave home! 2) You drink less alcohol, caffeine, and more water! You also probably eat more fruits and vegetables than normal. This feeling can occur when you’ve overindulged over a holiday period (e.g. bank holiday, family holiday, Christmas, birthday, easter), OR, you have an event coming up like a wedding, holiday, party, or just summer in general and want to feel better. It’s also quick, easy to follow, and way more exciting than “everything in moderation” that you may hear from a registered dietitian or healthcare professional. 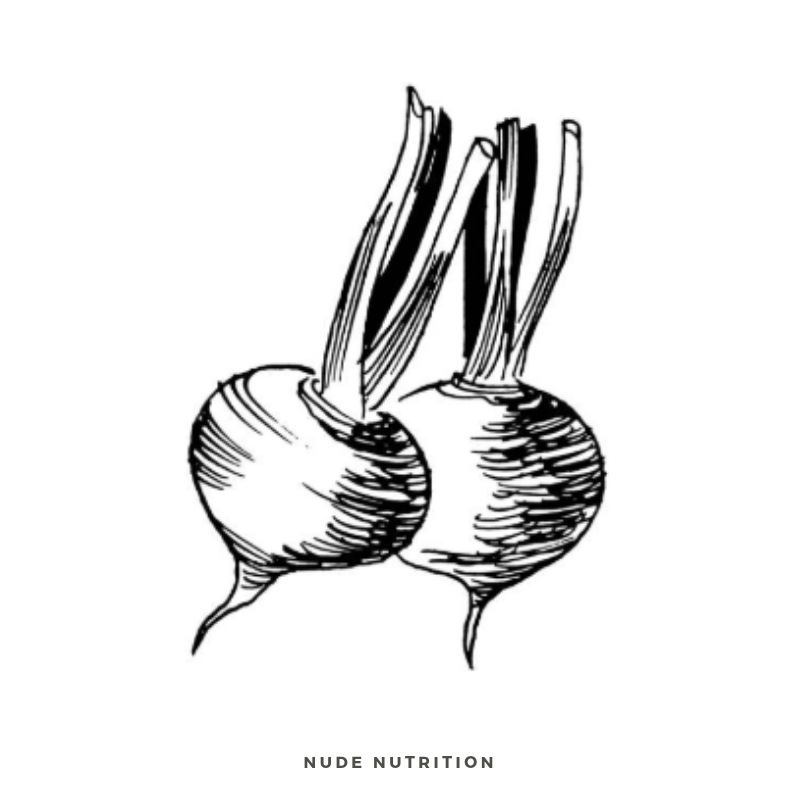 You sift the internet or speak to friends/colleagues about what juices/cleanses may have worked for them. 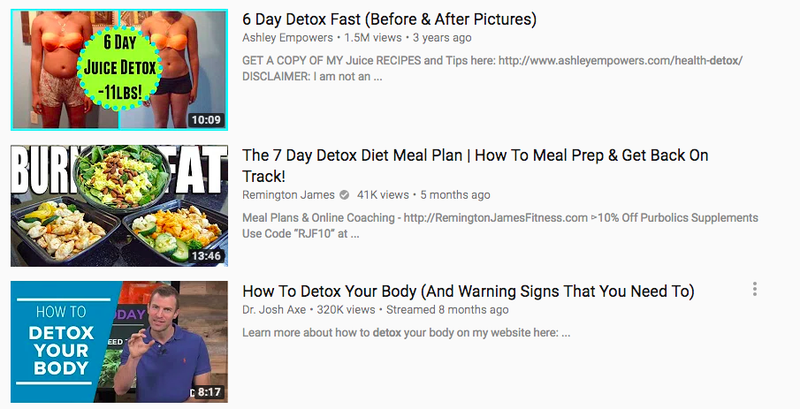 In fact, 20% of young people head to YouTube for nutrition advice these days, and apparently, if it’s backed up by a health blogger, then that’s all the evidence needed – sigh! You then buy overpriced supplements or juice cleanse packs that are not backed up by science. 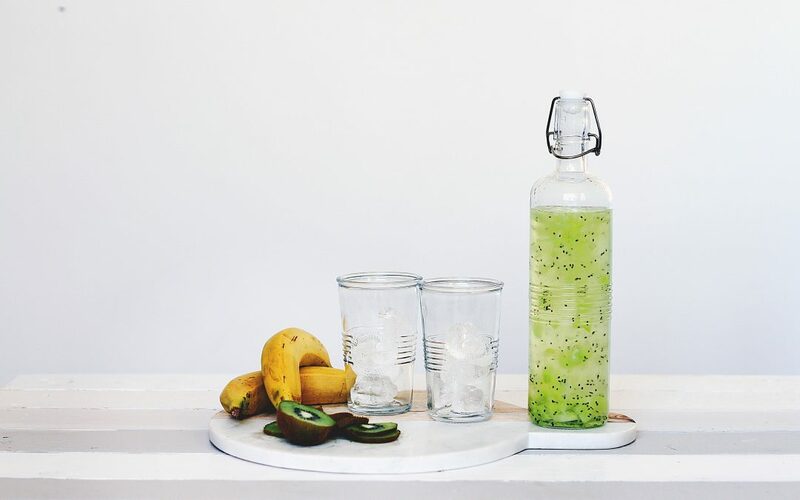 This could be 5 days, 10 days or more… it depends on which detox plan you get your hands on. It’s not expected you will be productive, be able to concentrate or be a nice person during this period! You will spend much of your time irritable, with headaches, or asleep! You emerge from your hibernation from food, with a little less fluid and muscle mass than you did at the start. You learn that chewing food actually feels quite good, it’s sociable, tasty, and gives you the energy and nourishment you need to be your best! 5) Feel guilty/ashamed/distressed about this whole cycle, which may feed back into point number 2…and the cycle continues. Once you’ve broken the cleanse or diet, you feel a failure… not ever considering that the diet actually failed you!! You may then start the cycle again at point 2, or if you have done this enough times, you reach out for some proper advice. Something realistic, tailored, and sustainable! If you are fed up with battling with your weight, or binge eating, emotional eating, stress eating, yo-yo dieting, check out my FREE download. 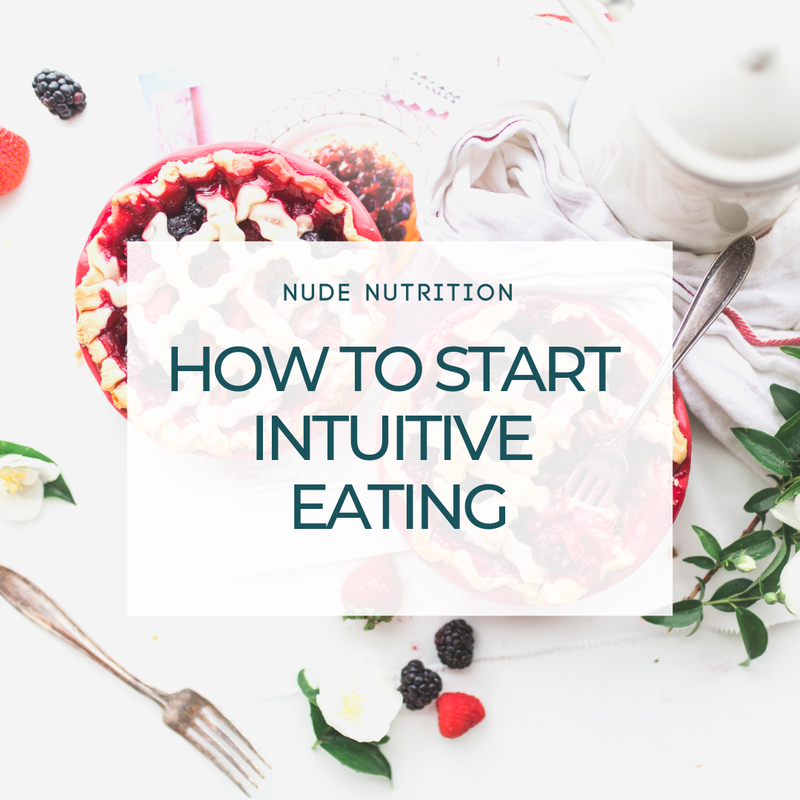 This will guide you through some of the first steps of intuitive eating to help resolve your food problems. This article is not intended to provide individual advice, and it’s important that you seek support from a qualified professional. Soya and Cancer – what’s the deal? 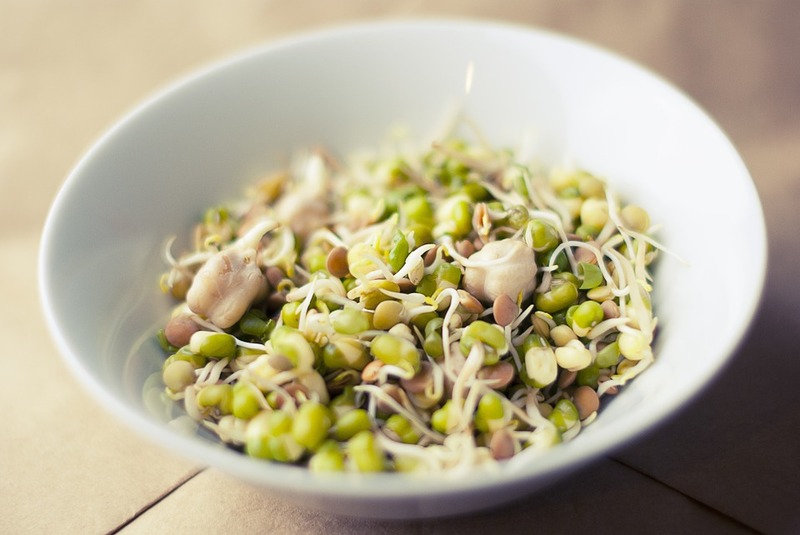 Soya beans and products have become a hot topic recently in the rise of more plant based diets, and in particular the link between soya and cancer. Soya beans are are a popular, and cheap legume, native to East Asia. Soya contains a good amount of protein, fibre, potassium, magnesium, copper and manganese. It is also one of the few plant foods with all the amino acids your body needs to make protein, plus, they are a good source of healthy fats, containing both the omega-6 (linoleic acid) and omega-3 (alpha-linolenic) types. Soy beans can be found in many forms, including tofu, the beans themselves (also called edamame), soy milk, miso, and soy powder. Concerns have been raised due to the fact that soya has weak oestrogen (female hormone) like compounds called isoflavones naturally occuring in them. It’s thought that oestrogen can promote the developement, growth and spread of some cancers, and so research has been conducted into whether soya and cancer are linked, and in particular, breast cancer. One small study conducted in 2014, suggested that for some women, adding a medium amount of soy to their diets turns on genes that can cause cancer to grow. Once the cancerous tissue had been removed and analysed, the results showed that several genes that encourage cell growth were turned on in women in the soy protein group. However, as with most research, ther study had limitations. The study didn’t last long enough to know whether these genetic changes would cause cancer to actually grow. The study also didn’t look at whether soy does or doesn’t reduce the risk of breast cancer, or whether eating soy would have any effect on women who don’t have breast cancer. The researchers could not conclude that soy should be avoided, and they could therefore not confirm a clear link between soya and cancer. So should I avoid it? The current advice is no. The American Institue of Cancer Research and the World Cancer Research Fund for cancer prevention have reviewed the evidence extensivley in this field. Evidence shows that soya does not increase the risk of breast cancer, breast cancer recurrence, or any other cancer. Soya and cancer, and it’s possible effects on health is an active area of research. In general, it is fine to eat moderate amounts of soy foods – about one to three servings per day as part of a balanced diet (a serving is about a half cup). If you’ve been diagnosed with breast cancer and are concerned about any isoflavone effects, ask your doctor or a Registered Dietitian for further and more individualised advice. Research on soya and cancer, and soya foods is ongoing, but it is clear that soya is nutritious, safe and healthy. Other potential health benefits include lowering cholesterol and even reducing the severity of hot flushes in women going through the menopause. Soya foods can also help us to achieve an increasingly plant based diet by reducing our intakes of animal protein which can also benefit the environment and food sustainability. 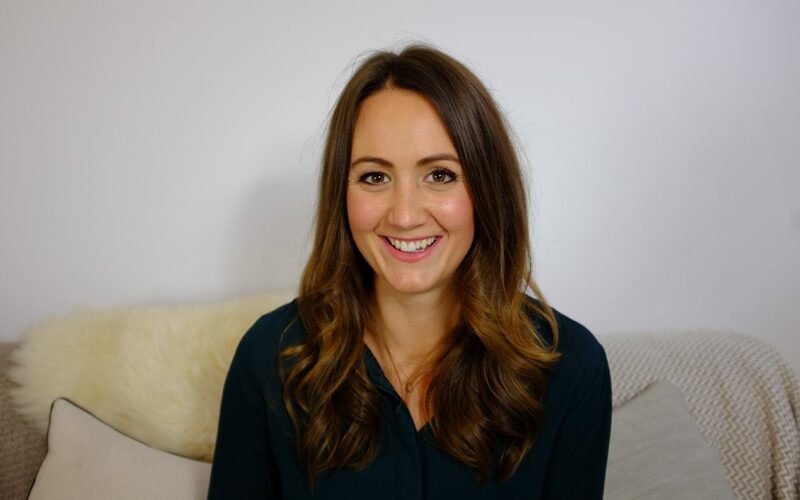 I am Katherine Kimber, a Registered Dietitian Nutritionist and I am on a mission to set you free from dieting and confusing nutrition information.I have completed an extensive amount of formal education and training, achieving a first class degree in Nutrition and Dietetics at King’s College London, and a distinction in my Masters in Clinical Research. 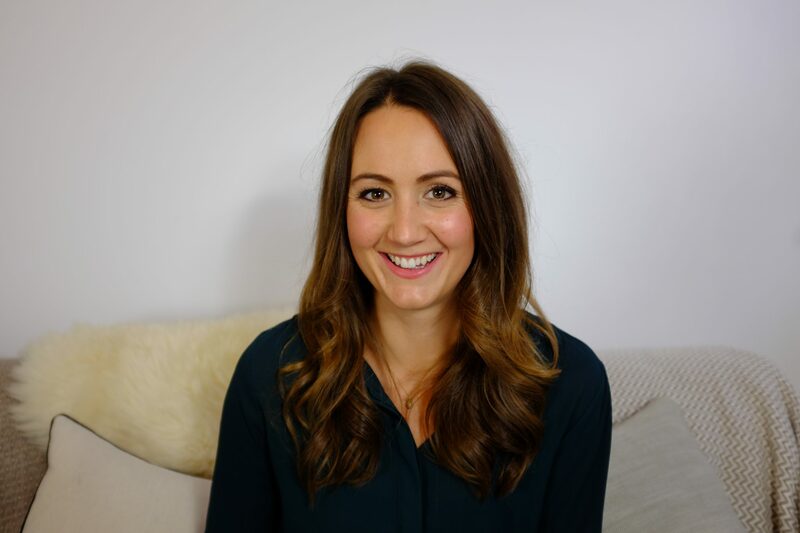 I am also highly experienced in providing motivational support, I’m trained in Intuitive Eating, and hold a Diploma in Neurolinguistic Programming.Let me know how I can help!